Infrared LEDs are used for remote controls (they're the little LED in the part you point at your TV) and 'night-vision' cameras, and these little blue guys are high powered ones! They are 940nm wavelength, which is what nearly all devices listen to. They're 20 degree beamwidth, and work great for any kind of remote control application. This is a pack of 25! We used one of these to make a camera control footswitch/intervalometer. 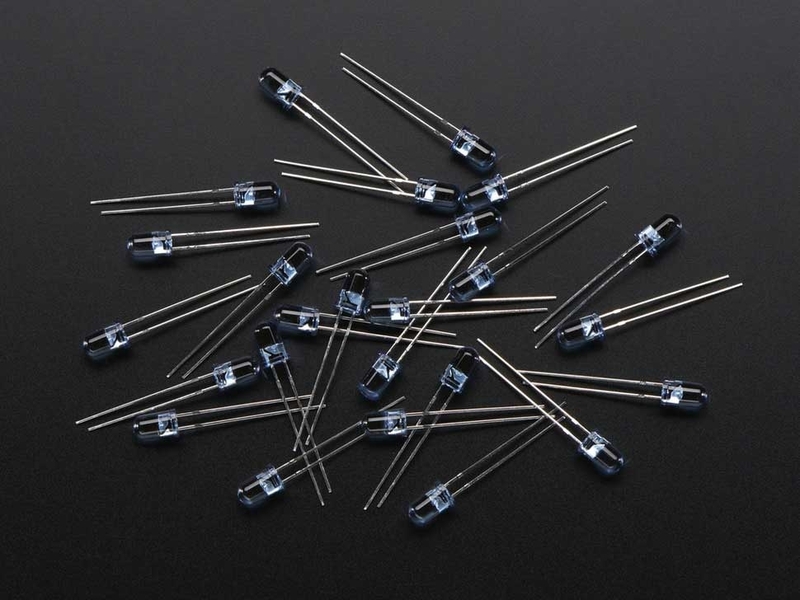 These are the same LEDs we use in our super TV-B-Gone kit. You can drive them continuously (for 'night vision' illumination) with 100mA and for IR remote application they can take up to 1 Amp pulses (!). For high powered use, we suggest matching these up with our power MOSFETs. If you want to make a sender/receiver pair, you'll want to get an IR remote receiver sensor as well.